Linda Berardi remembers the date: Sept. 3, 2010. She was fired from her job of more than 20 years at a behavioral health organization. Today Berardi, with more than 25 years experience in leadership development and organizational consulting, is founder and principal of Willow Oak HR Consulting. “I found light. I found hope. And I found my next gig,” said Berardi, delivering her talk “Advancing through Change: Leading with Resilience” as part of the Women’s Leadership Speaker Series. Berardi stressed the importance of developing resilience in response to life’s stressors. Doing so requires the ability to treasure what’s important, and for Berardi, that didn’t mean valuing her education or certifications. 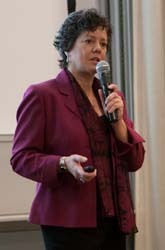 Berardi centered her talk on appreciative inquiry, which focuses on an organization’s strengths rather than problems in order to develop solutions. Tidewater Community College President Edna V. Baehre-Kolovani has embraced that same philosophy in developing a strategic leadership plan for the college. “Instead of identifying problems, why not amplify success?” Berardi asked. Appreciative inquiry is an ongoing process, Berardi said, meaning making time for “appreciative check-ins,” sharing stories of success in the face of change and collaborating with others to seize the opportunity to innovate.